Tatare has such a long tradition in Europe, and it is one of the dishes that sort of never “Goes out of style.” Over many years in the culinary world this classic dish has been interpreted, deconstructed, and reinvented much to our pleasure. And yes, our dear friends, there is such a dish in Korean cuisine. May we present Korean Beef Tartare, a.k.a Yukhoe. 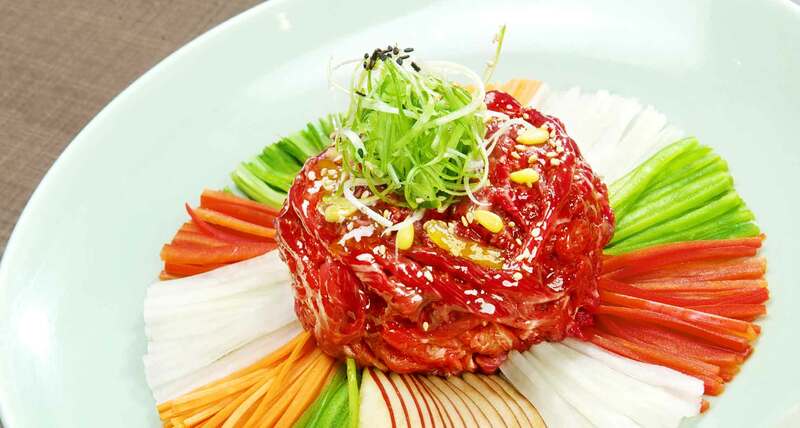 Yukhoe is a raw dish in Korean cuisine, usually made from raw beef seasoned with various seasonings. The most tender part of beef is thinly julienned with the fat removed, then mixed with seasonings. For the seasonings, soy sauce, sugar, salt, sesame oil, spring onion, a hint of garlic juice, and yuja juice are used. A raw egg yolk and pine nuts are added as well. Most researchers have noted that Yukhoe was served at the Korean royal court. The original recipe has not changed much with time. According to the 19th century cookbook, Siui-jeonseo, the modern day variations are very similar to the original recipe. Yukhoe really would be a taste sensation for a new comer to the Korean royal court, and we would argue that, for meat lovers, this dish is impossible not to fall in love at first bite! Click HERE to view our version of Korean Beef Tartare on SURA Menu.